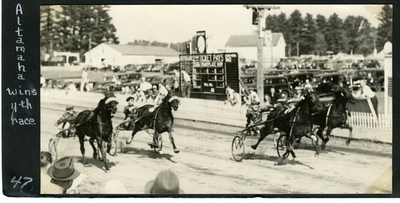 Black and white photograph of brown mare, trotter, Altamaha, Safford up, winning the fourth race of Friday, September 15, 1939, at the Oxford County Fairgrounds, South Paris, Maine. Black stallion, Renown, Clukey up claimed second place. Bay gelding, Zombro Hanover, Chappelle up showed in third place. Bay gelding, Peter Dale, Jordan up, showed in fourth.